Has the new Attorney General found a new level of Fiscal Conservative? According to the letter received Friday 2/27/2015, a statutory requirement for a determination to be made by a prosecutor or investigator is now translated so a records clerk is close enough. Played out, we can do away with the judiciary, prosecutors and detectives in lieu of janitorial staff making decisions in criminal prosecutions. Consider the request for a recording the existence of which came to light on review of civil forfeiture documents. So here is the problem detailed in a requestor response to the AG request. The Attorney General apparently ignored the response and issued the following memorandum opinion. You have to wonder if they even read the request for ruling and simply rubber stamped the response. If the requestor response was considered, the AG has ruled a statutory requirement for a determination to be made by a prosecutor or investigator combined with a requirement to articulate how the release of information would interfere is completely unnecessary. Again, if a statutory requirement is irrelevant, we can simply dispense with judges, prosecutors and investigators and simply ask the janitorial staff if a person so accused should go to jail. In a column published by Radio Legendary, details emerge related the the settlement of a multi-million dollar lawsuit. Documents responsive to a public information request further support early theories settlement of the lawsuit, contrary to reports by main-stream media, was not related to risk management but rooted in keeping the skeletons in the closet. A public information request shows that Blossman’s evaluation after 6 months on the job showed a mediocre rating of 5.6 out of a possible 10 points, nothing unusual for a new hire still learning the tricks of the trade. When the documentation was changed over Eubank’s signature, he had received a glowing 7.75 points, complete with hyperbolic and superlative descriptive comments. Documents in a lawsuit claim McLennan County Sheriff Parnell McNamara broke campaign finance laws and retaliated against a supporter of his political opponent by trying to block him from getting a job as a local police chief. Further traction was attributed to the dismissal of a very similar lawsuit in Bell County just the day before the local suit was settled. You will probably be much happier to take the word of the Waco Trib that your benevolent leadership was looking out for your best interest. Cuss? Discuss? Debate? Go here. Posted in Uncategorized	| Comments Off on About that lawsuit. There have been many allegations that I am responsible for press coverage of an internal investigation at the Sheriff’s Office of the K9 program. The reality is I have withheld my opinion for lack of information. On Friday, the Sheriff’s Office released a large amount of information and buried in there was the reprimand of former K9 officer who had been thoroughly vilified in the media. Based on the record, it’s my opinion Corporal Ballew took one on the chin. The reprimand says the basis was a training event that resulted in injury of a fellow officer. While the case can be made Deputy Ballew exercised bad judgment in conducting a training exercise in a busy office, I believe the same case can be made the error was on the part of supervisors. I believe the records indicate inadequate supervision and support of the K9 program. Records indicate Deputy Ballew was successful as a K9 officer while the records of his successors and chief accusers are questionable. No word yet on if the business manager for the County Judge got a raise when she should have been fired. This, however, did make the Waco Trib. The court also voted to allocate $750,000 in the budget for Phase II of the courthouse roof repairs and architectural and engineering services. The county originally hoped to spend about $373,000 on the project, based on an estimate prepared by County Grant Coordinator Dustin Chapman last week. What Regina does not say is if County Grant Coordinator Dustin Chapman was actually approved to receive the $1,000.00 a month raise which was added sometime during budget negotiations. No reason screwing up and missing an estimate budget expenditure by more than a quarter of a million dollars should have any impact on compensation. Stay with us as the full analysis of the approved budget is coming soon. In this post found on the Legendary (Service Pins), the case is made that the office of the County Judge engaged in illegal conduct. In a slightly more lively version, Shane Warner takes on the subject. 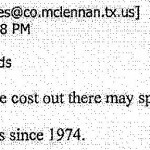 McLennan County Commissioner’s were also delivered copies of the e-mails from the Judges office. 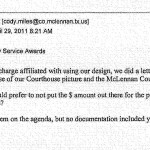 Will McLennan County Commissioners reward the illegal conduct of the Judges business manager? Many years ago I worked for the Sheriff’s office. One afternoon I was stopped by a Waco Police Officer for exceeding the speed limit. Then administrative lieutenant Larry Lynch insisted on my dismissal. In retrospect I am glad he took that position because the result was a thorough investigation of my actions. The result of that investigation was the criminal charge was determined to be unsupported as I was en route to a call of sufficient importance to justify my actions. A policy violation turned up in the investigation and for that violation, I was suspended for three or five days. It was a long time ago. I did not file a grievance or appeal the decision of then Sheriff Bob Mitchell. I was just thankful for the exoneration on traffic charge. If the County Judge imposed a sanction similar to the one I experienced, I’m OK with that. To paraphrase William Wayne Justice, “If you clean up your own house, no one else has to do it for you.” If he did not and the Commissioner’s not only endorse the conduct by funding the position but go further and award an increase in salary to a person who clearly engaged in criminal conduct…. Court meets on Tuesday morning and one of the items on the agenda is approval of the budget. CourtAudioMinutes8-19-2011 This is the .WAV file. CourtAudioMinutes8-19-2011 This is the .MP3 file.